Welcome to Season 4 of Lida Farm CSA! For some of you, this is something new while others are “old hands” at this point. We’ve been plugging away, working up to this first delivery. A lot like last year, I’ve been nervously looking at the fields, hoping something would grow enough to get into this first box. I can’t say that the last couple of springs have been good to us; the only variation from last year is that it was mostly cold and dry until recently, whereas last year was cold and extremely wet. Either way, a lot of plants have been just sitting there in a holding pattern of sorts. Typically the Lida Farm Journal includes some news of the farm, a listing of this week’s produce, and a simple recipe which features a veggie or two. But, being that this is the first week of the season, I outline what to expect for the CSA season, so you all know what you’ve gotten yourself into. 1. Boxes: The box gets delivered every Friday, typically late morning to early afternoon. Each week we exchange your box. You set out last week’s empty and we give a new one filled with veggies. The boxes are waxed and get used for 2-3 seasons (this cuts down on all that excess packaging that gets thrown away). We don’t have a lot of extras, so please remember to empty and put out. Please also return green trays and flower vases for flower share. 2. E-mail Newsletter: Up till now we’ve always printed out a paper copy of our newsletter. But, both to cut down on paper and general ease of delivery, we’re moving to an electronic newsletter which will come to your e-mail. When I add something to our blog (http://www.lidafarm.com), you’ll receive an e-mail automatically. Since all news is on our blog, you can also add comments for others to follow…maybe add a recipe of your own. 3. “I’m out of town”: If you are gone some delivery day and will not be around to receive your box, please make arrangements for somebody to pick up at your drop site and put the produce to use. Once we get a route, it’s tough to change it and we really prefer not to make a special drop-off. If not, just give us a call and we’ll work something out. 4. Cooperation: As the name CSA (Community Supported Agriculture) implies, you are buying a share of this year’s harvest as a member of our farm. We will always do our best to supply produce in good quality, quantity, and variety each week, but part of a CSA is that you share in the risk with us. Anything can happen between now and October which may affect supply from a hailstorm to a cucumber beetle infestation which can make the box can get a bit light. We’re all in this together. We share in both the risk and the bounty. 6. Season’s Schedule: We will run a 16 week season, so the last delivery will be October 9. If there is a change to our schedule, I will notify you through the newsletter. 7. Add-ons: This is something new this year we’re trying after hearing from members and non-members alike. As part of this, we will offering things in addition to the weekly box like cut flowers, organic cheese/butter, eggs, extra produce, and other local foods we can source from other growers. Every other week, you’ll get an e-mail of what’s available and order up what you want. We’ll deliver with your box on Friday. We’re calling it the “Marketbasket” program. Stay tuned for details. Salad mix: This has been washed once (unlike the bagged mix which does a triple wash), so please soak in some water before spinning again, especially because we’ve had some heavy rains which gets soil on plants. Collards: The standard southern green. To prepare, chop bacon and onions and brown together in a frying pan. Chop collards and add to pan. Once wilted, add some water and cover for a few minutes. Deep Purple Green Onions: yes, they’re purple…a little change up from white. Green Lance: An Asian green which is also known as Chinese kale…tastes much like other veggies in the cabbage family. It’s great added to a stir fry for the last minute or two or fry up until sautéed till wilted as a side. Bok Choi: See recipe below. 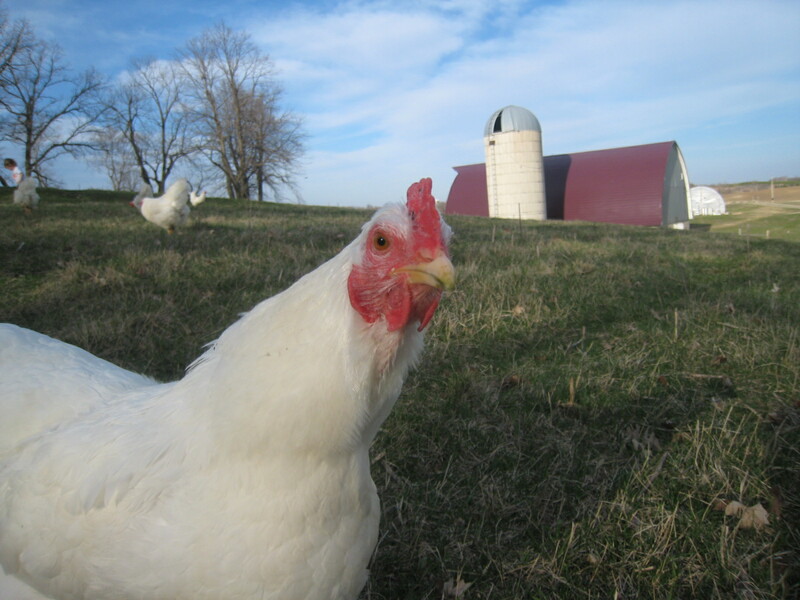 Eggs: Free-range fed on transitional organic feed. 1. Heat grill to high; lightly oil grates. Cook rice according to package instructions. With a fork, stir in vinegar and red pepper flakes; season with salt. Cover and set aside. 2. Make glaze: Combine honey,soy sauce, and ginger in a small bowl; season with salt and pepper. Gill until opaque throughout, 5 to 7 minutes per side. Brush pork with glaze, and grill 30 seconds more per side. Transfer pork to a plate to rest. 3. In a bowl, drizzle bok choy with sesame oil. Season with salt and pepper and toss to coat. Grill until lightly charred on both sides, 1 to 3 minutes. Transfer to plate with chops. Serve pork and bok choy with rice alongside. I haven’t been strong enough until now to write about this episode. 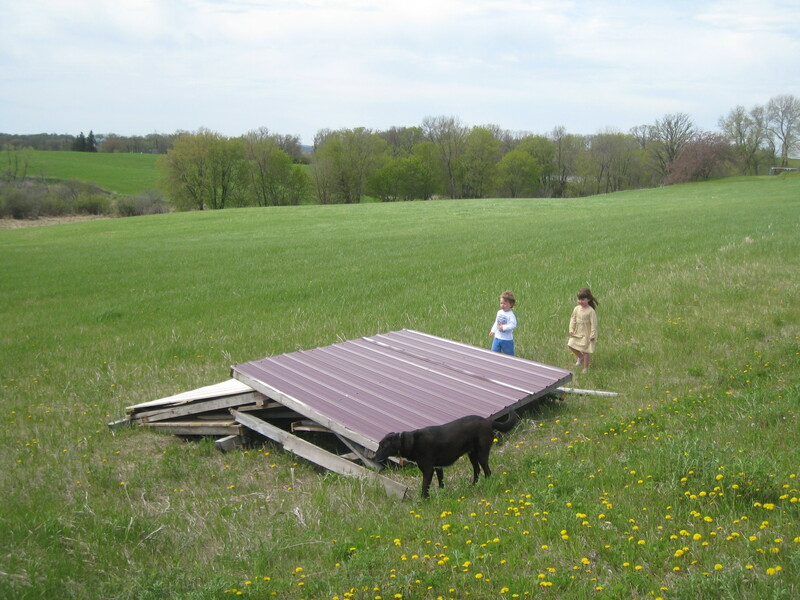 A high wind blew the farm stand into our field on May 15, totally trashing the landmark I was once so proud of. As you can see, the kids and Cosmo were out assessing the damage. I don’t like surprises early in the morning but that’s what I had when I stepped out, looked down the driveway, and didn’t see anything. After all the high winds the night before, in a millisecond I knew exactly what happened. Picture me running across the field yelling “NOOOO!! !” as if rushing to the aid of a fallen comrade. But fear not, the stand will rise again from the ashes. The original builders, myself and my father-in-law, Don, have already drawn up plans for a better, stronger farm stand which won’t blow away. We still plan on opening in July, hopefully with no more surprises.